The Mormon Temple in the early morning sun. It did not take me 24 hours to fall in love with Utah! 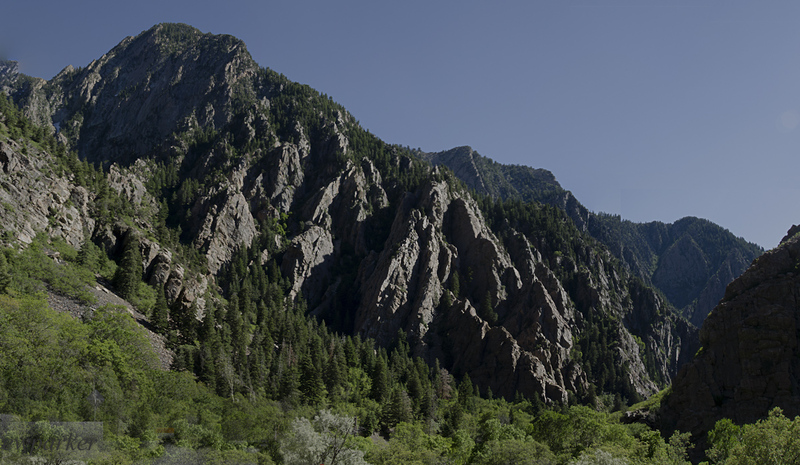 That surprised me: I assumed this stopover in Salt Lake would just be a check off on my list of the places I have been. But from the moment I approached the airport, checking it out from the plane window, I was enthralled. I arrived right about 8:15 pm, just as the sun was setting. The shadows created by the peaks of the mountains were spell-binding. The westward facing slopes were brilliantly lit, the valleys deep in darkness already. Realize that the mountains will always be fascinating to girl from the land the glaciers flattened! Saturday morning, we were up and out early. Everything was very quiet. (It is Saturday morning, downtown.) The day was beautiful. There was hardly a cloud in the sky and it was cool, but we could definitely tell that it wouldn’t be for long. The air was very fresh and the city very clean. The sun was shining, what was not to like? Our first destination, following breakfast, of course, was Temple Square. Our hotel was just a couple of blocks away. We walked the entire square, the stately and varied buildings garishly illuminated by the early morning sunshine. Again, it was pretty quiet, very few people around, and those we did see were all dressed up for a wedding. We did not visit any of the buildings inside because of the early hour. Feeling like we had pretty much covered the sights around the hotel and the immediate downtown area, we decided to go to the state capitol building. 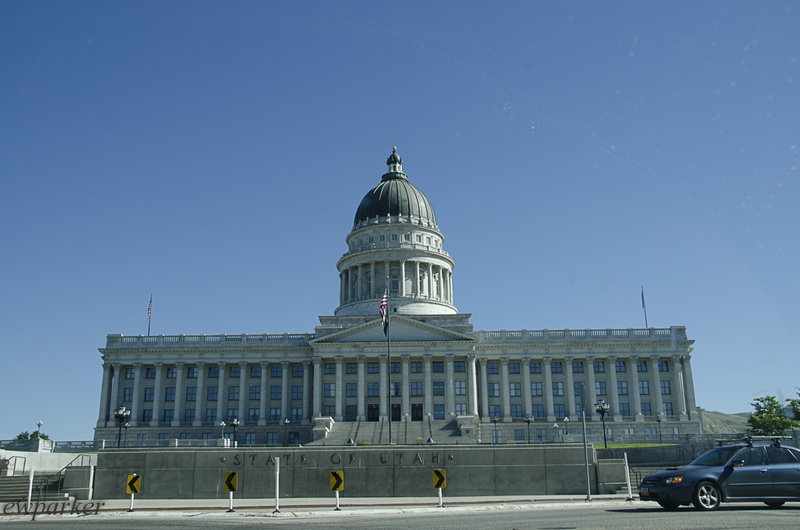 It really dominates the skyline – not because it is the largest, fanciest, or tallest building, but because its traditional shape is quite unlike all the modern buildings that create the Salt Lake City skyline. 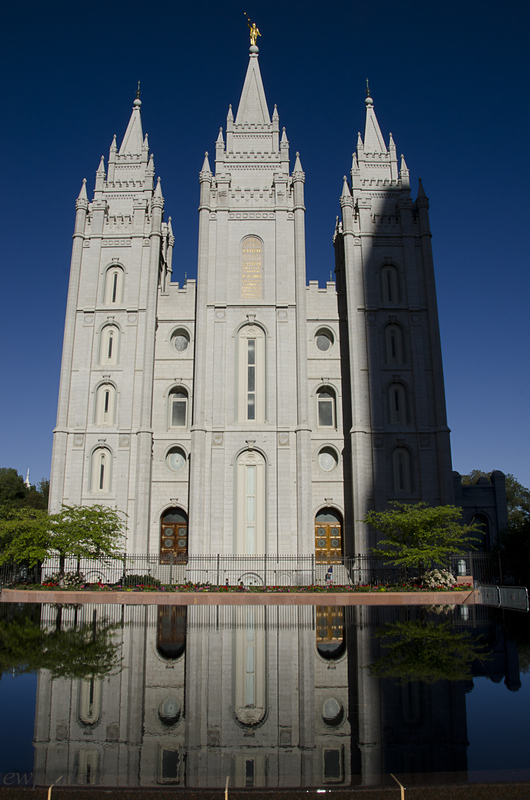 Interestingly, for all the importance the LDS church has in the city, you do have to look for the Temple. From the airport vantage point, it is visible driving into the city, though it is dwarfed by the modern, commercial buildings. From other directions, it is hidden completely. The Capitol building is also higher up, situated in the foothills, and surrounded by buildings that are not nearly as tall. It is quite commanding! We parked near the capitol, and walked completely around it. To one side, the State Senate and House of Representatives buildings face one another across a green square. 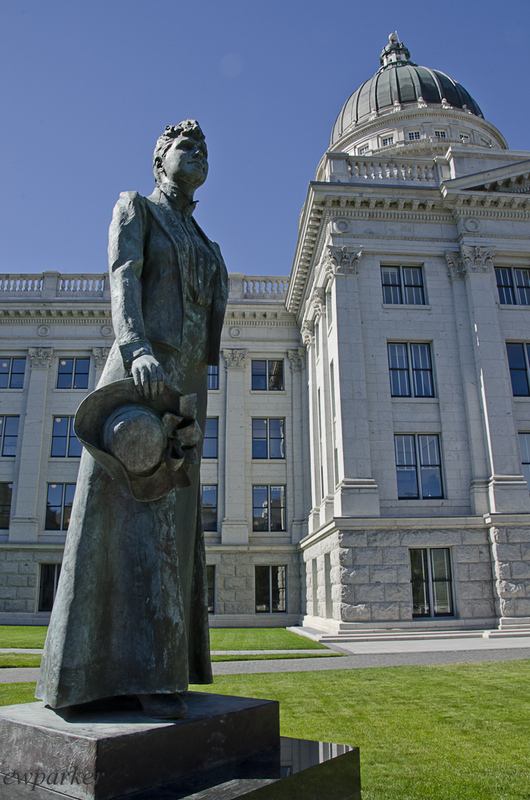 The four corners of the square are anchored by statues of famous Utahans, one of whom is female. From the balconies of the capitol the mountains to the east rise precipitously, and now, during the daylight, I can clearly see that they are capped with snow! The view from Memory Park back to the Capitol. (the Capitol building is at street level. 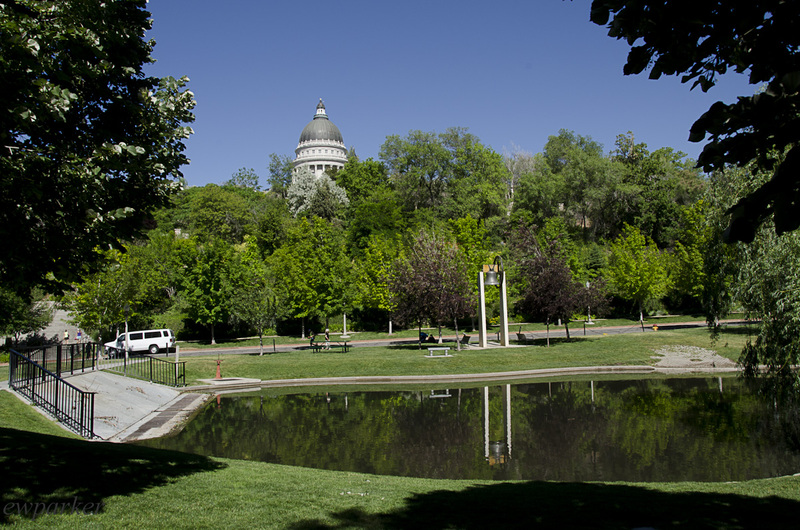 Next to the Capitol, there is a valley called Memory Park (Though we also heard it called Memory Grove). It is a park dedicated to the soldiers who fought and died in the various wars. Lovely monuments have been created for each of the wars, and the surrounding greenery, walkways and stream, all located below the street level, create a tranquil park for recreation or contemplation. The place was pretty busy on the Saturday morning. (Instead of downtown, everyone seems to be here!) There had been a race through the natural areas of the park, now mostly finished. 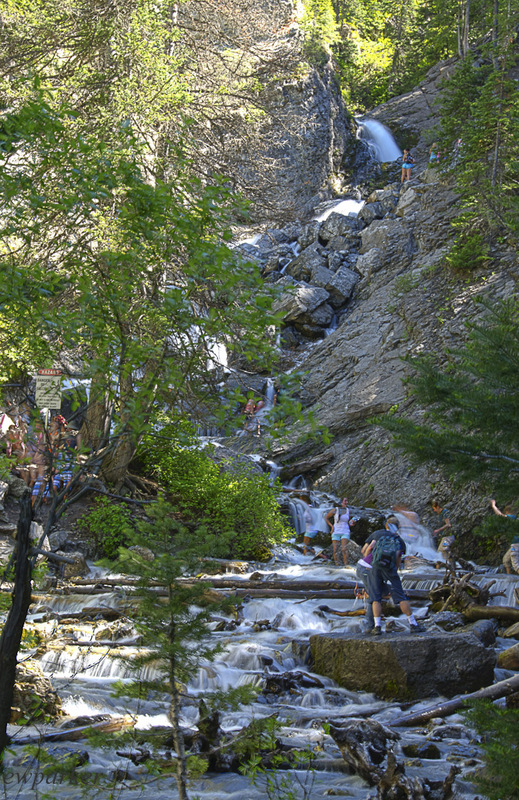 Lots of families, dogs and children contributed to the noisy, cheerful scene along the stream. We had been told that there was a hike here, but we started along the path and realized that it was a very nice walk, but there wasn’t much to see – again because the park was below street level and heavily wooded. It was also hot. We abandoned that plan and decided to go exploring in the mountains. 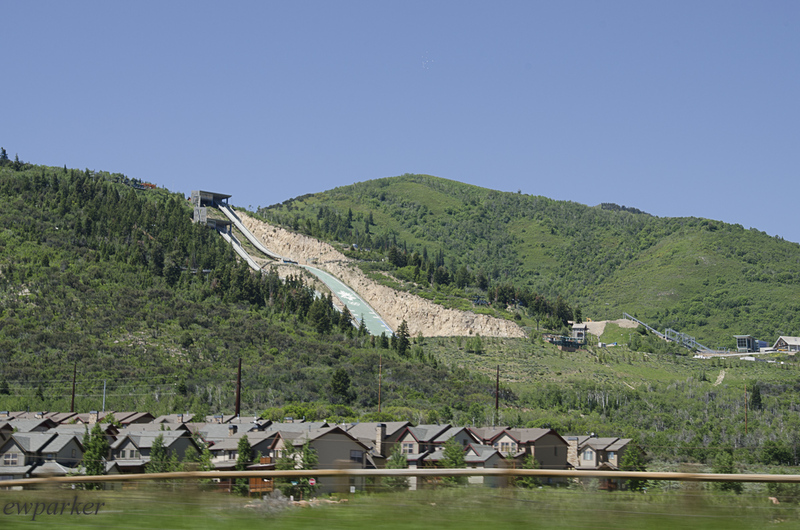 We did drive up to this place – the Olympic Training facility (ski jump showing here) but did not stop to visit. You can tour the facility in all seasons. Back in the car, we headed east on I-80, going up into the mountains, and then getting off the expressway to drive to Park City. Along the road there were many opportunities to leave your car and hike away from the road, or to even just to stop and enjoy the view. We did it whenever we heard ourselves saying “This is so beautiful!” more than 4 times in a row! (Not really, but almost! )The names of the ski resorts in these mountains are nearly legendary, and though there is no snow at these altitudes in June, it is not difficult to imagine how incredible it must be in the winter. It is certainly beyond beautiful in the summer! I can so see a summer house up in these mountains! (Not the least because it is notoriously hot in the summer down in the valley). Before stopping for lunch in Park City, we drove through Deer Valley. I was expecting something smaller …. 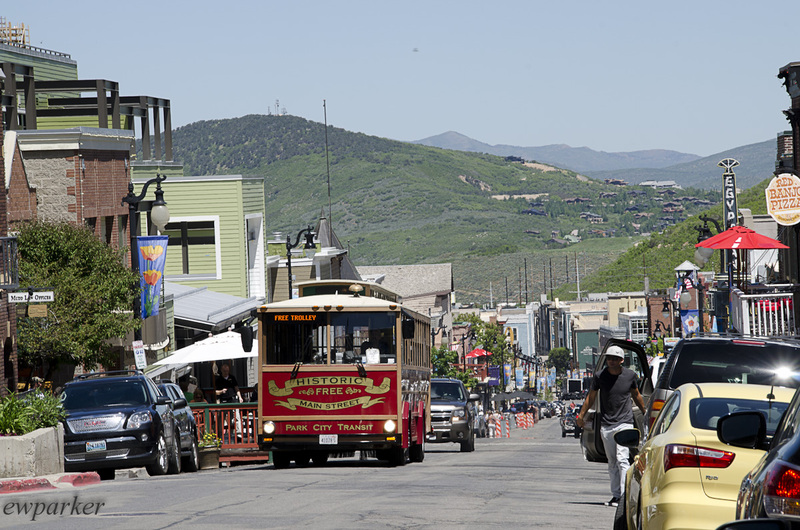 In Park City, we parked and walked the historic Main Street. It is very touristy, but really pleasant nonetheless. There were lots of interesting shops, mostly art galleries and clothing stores. There were the requisite high end realtors, too! It was such a beautiful day – warm in the sun and cool in the shade – perfect for lunch outside. Though the town is probably a tourist trap, it was not all that crowded, and it had a nice feel to it. I would love to compare that day with a winter Saturday. Back on the canyon road, we made a wrong turn had to backtrack, losing about 45 minutes. The roads are not well marked and we should have had a good map or used our GPS. 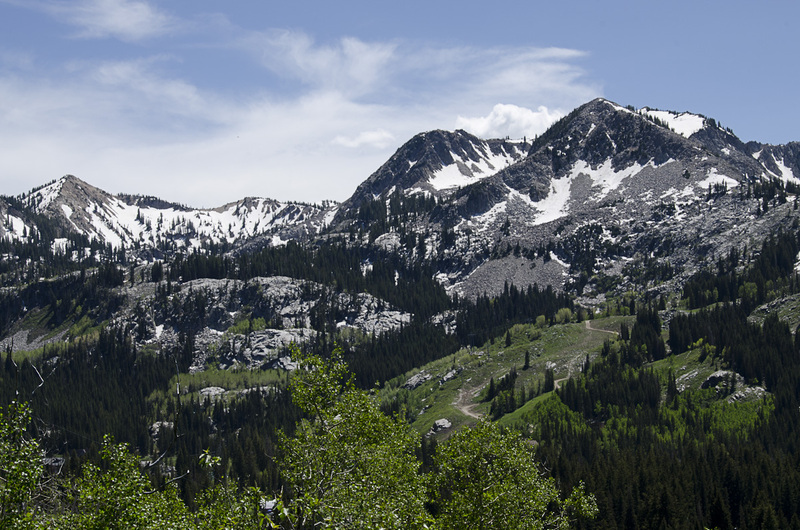 A panorama of Storm Mountain in the Big Cottonwood Canyon. We arrived back at the hotel at about 5 and we were exhausted. All in all, we walked over 11 miles and, according to my Fitbit, climbed 78 stories…a nap was the most we could manage! Rested we went out to dinner, just a two block walk from the hotel, at a place called Valter’s Osteria, an Italian restaurant. Dinner was wonderful. I can recommend Valter’s – the service is as good as the food. It is a friendly place with a lot of action. 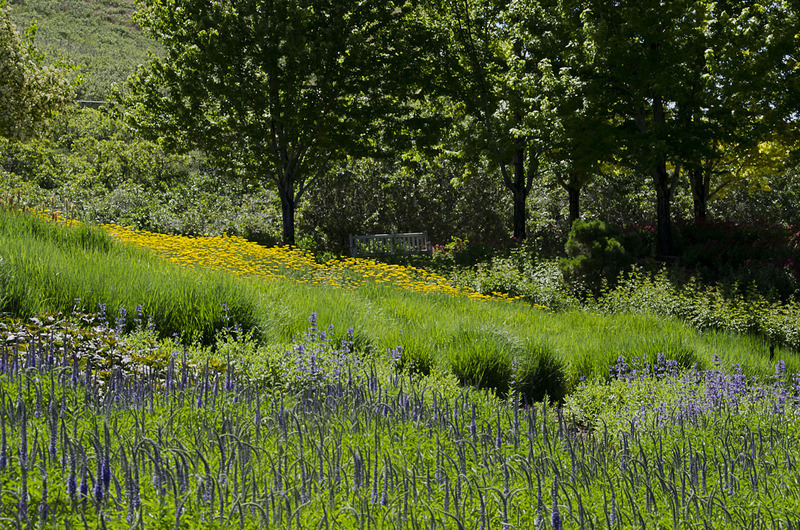 We went to Red Butte Garden, a botanical garden and arboretum on the University of Utah Campus. We had a two hour stroll through the well-maintained garden. Naturally, I loved taking pictures of the flowers. I love taking pictures of them as much as I love growing them, so finding the plants and flowers that are familiar because of my garden in WI is always fun for me. I always get ideas – new varieties, and how to combine to different plants to create a bigger effect be it for color or texture. 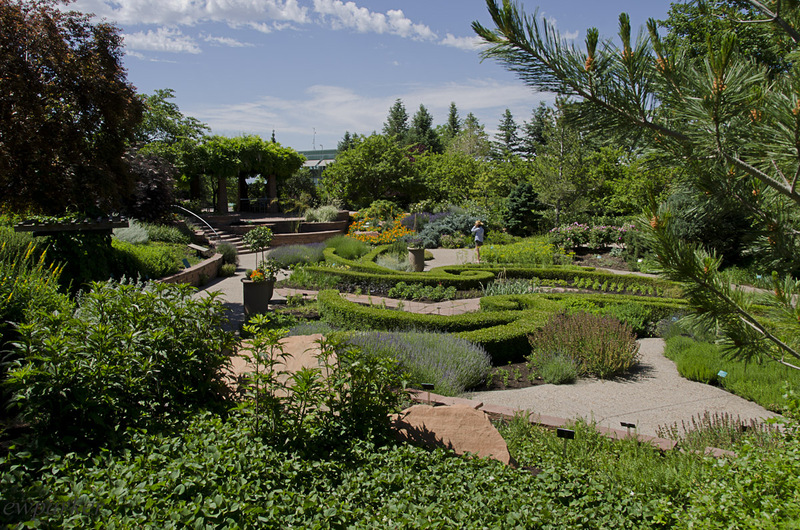 I was impressed by this particular garden because of the breadth of activities and enterprises going on within its overview. In addition to the requisite gift shop, there was an art gallery – the quality of the work on display was excellent. The garden has a summer camp. It has lecture series. It has special days and special events. It has guided tours, birding tour, cooking and yoga classes, and workshops. It has a film festival, too! It also has a wonderful outdoor amphitheater where there are concerts – including Brian Wilson, Hank Williams, Steve Miller Band – hardly a localized draw. What I am trying to get at is that the variety of uses within this garden will ensure its community relevance and financial security, issues no not-for-profit can afford to ignore in this day and age. This is the Atrium of the Library. 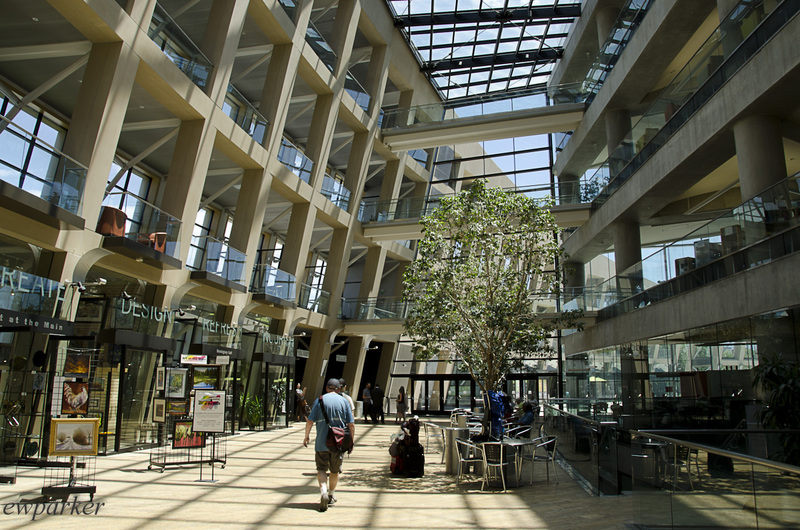 Since we were in the area, we stopped to explore the Salt Lake City Public Library. OMG (to borrow a text). It is standard nowadays to talk about libraries emphasizing everything but the books. This is a library that emphasizes everything including the books. It is really amazing. The entrance is a large very high atrium. There are coffee shops and other little shops (even a used book store!) along the outer edge, and the inner edge is dotted with tables and chairs. The inner edge has a four story glass wall that allows you to see into the library – into spaces where there are chairs for readying, computers for studying, book shelves, displays and more – all throughout the structure – and not confined to particular areas within the space. It is one of the most inviting libraries I have ever experienced – that comes from a person who loves a library, good or bad, new or old. Finally, we ran out of energy in the heat. We did a few errands and left for the airport. We dropped off the car and took a shuttle to our hotel for the night. Our photo workshop would begin the following day. I will return to Salt Lake City. There are things I want to see, particularly the Utah Natural History Museum. It is right next door to the Red Butte Garden. (Perhaps these are uneasy neighbors judging from the aggressive parking signs.) The building is modern and sounds intriguing – being able to walk up through the layers of desert, foothills and mountains to see the flora, fauna and I suppose geology, too. I think this may be a city that, each time you fly through it on your way someplace else, you could stop over to see a museum, an event, or have a great meal. It is probably not a place for a week-long vacation. For that, you would definitely go up into the mountains instead. Betsy, we lived there for 15 years. It is a beautiful city and the mountains are truly gorgeous! My family now lives in Denver but I have many fond memories of Salt Lake. You sure packed lots into your trip there!